Alex Jones' Trump-endorsed InfoWars site exposes NASA's Martian slave colony. 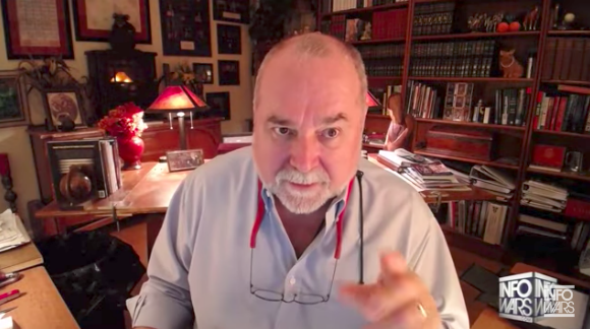 Mars child slavery expert Robert David Steele during his interview with Alex Jones. President Trump conducted an interview in December 2015 with noted conspiracy theorist Alex Jones during which he praised Jones’ reputation as “amazing,” and the two reportedly remain in touch. (Jones’ site InfoWars has reported, among other things, that the U.S. government planned 9/11 and that the Sandy Hook massacre was staged.) Trump’s administration, meanwhile, appears to have distributed a February press release to InfoWars, and in May, the White House gave a press pass to an InfoWars “reporter.” Trump’s 2020 campaign organization also cited the publication in a mass email earlier this month, and Trump’s son Donald Jr. has said that another well-known conspiracist (Mike Cernovich) now employed by the site deserves a Pulitzer Prize. NASA has denied the allegations, which means Trump is now faces the classic political dilemma of having to take sides in a fight between the government agency he supervises and the friendly media outlet which is accusing that agency of kidnapping children in order to enslave them in space.